Audi R8 Spyder: belt up and mike up | What Car? Audi's R8 Spyder will come with a world first for mobile phone users Bluetooth microphones incorporated into the car's seatbelts. 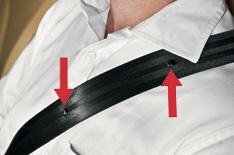 The driver's and passenger's belt have three microphones, each smaller and flatter than shirt buttons, so that they don't interfere with the seatbelt mechanism. Audi says that when the seatbelt is worn one microphone is always located in the vicinity of the person's mouth, regardless of their height, so it gives the best possible speech reproduction even with the roof down. Software analyses the quality of the signals from the mikes and forwards the best signal to the hands-free unit. A fourth microphone, mounted on the windscreen frame, is used to make calls when the car is parked and the seatbelt is not on. Audi says there are no plans as yet for the technology to filter down into Audi's other drop tops, the Audi A5 Cabriolet, the Audi A3 Cabriolet and the Audi TT Roadster.